Have you been worried for the relentless itching and skin inflammation? In case, it is accompanied with bumps, red patches, plaques and silvery scales, chances are that you are suffering from psoriasis. It can happen to anyone and any time. If not taken care of, it can lead to dry and cracked skin with signs like intense itching and burning sensation. Also, you might be affected with swollen and stiff joints. In short, having psoriasis calls for your attention at the earliest. Being an auto-immune disease, it can be non-curable. Basically, it is skin disorder which develops when your body’s immune system starts killing the healthy cells. So, it is said to be due “self-damaging” action of your immune which further causes red, itch and scaly patches. Plus, this isfound to be a chronic skin disorder and have links with severe problems including diabetes (type 2), heart diseases, and psoriatic arthritic. It can be categorized in following, according to the size and spot. Palmoplnatar psoriasis: If it occurs on the palms and the soles, it is Palmoplnatarform. 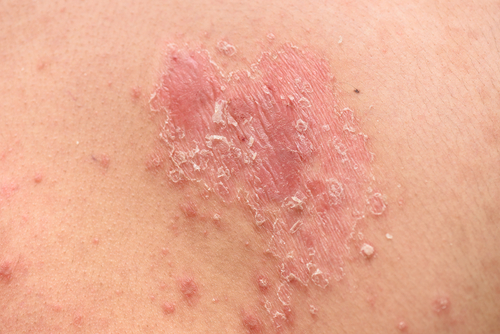 Erythrodermic psoriasis: It is said to spread on the entire skin surface. Guttate psoriasis: This one appears similar to drop. Pustular psoriasis: This one is referred to fluid filled yellowish blisters. Inverse psoriasis: When it occurs on navel, underarms, groin and buttocks, the name comes inverse psoriasis. The worst part about psoriasis is that it is still unknown what actually causes it. Different medical experts have different views on it. As per some of the reports it has been found that there are several genetics and environmental factor which triggers the problem. The list of factors includes skin injury,stress, infection, and several medications are reported to cause psoriasis. Besides, it can be due to some health conditions such as depression, type 2 diabetes, high blood pressure,high cholesterol, and psoriatic arthritis, which may lead to psoriasis. Here it is worth noticing that contrary to the popular belief, psoriasis is not contagious like other skin problem like Scabies. To control the problem, here is something you can do. Moisture YourSkin:Dry skin is more prone to psoriasis, itching and redness. So make sure you apply the moisturizer on daily basis. Pick one according to the dryness level of your skin. You can choose a thick ointment if you have extremely dry skin. And prefer a non-scented moisturizer. Get into a habit of applying the moisturizer within 3 minutesafter taking bath or shower. Avoid Scratching: It might be little hard to resist scratching the itchy or raised skin, but you have to control. Else it can make the condition complicated. As scratching breaks your skin, it makes an entry for the germs which passes from your nails to the exposed skin. You can consider application of some homeopathic ointment, if required. Warm Baths: Another way to comfort your skin is by taking warm bath. This will help soothing itchy and dry skin. Just fill the tub with warm water, soak yourself for 15 minutes. If you wish to enhance the healing, just add a good amount of grounded oatmeal or sea salt to your bath. In this case, you need to ensure that you use only warm water. Avoid cleaning with harsh soap which could else worsen your skin condition. This entry was posted in psoriasis. Bookmark the permalink.